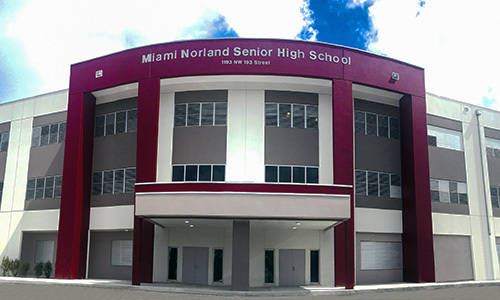 Welcome to the website for Miami Norland Senior High School, HOME OF THE VIKINGS. As principal, I am excited about the challenges and opportunities that the new school year will provide to our students and staff. Our commitment to "EXCELLENCE WITHOUT EXCUSES" remains the driving force of our efforts. It is our intent to improve our school's grade by increasing student participation in the PSAT, Advanced Placement Programs, extra-curricular activities, and incorporating Rigor and Relevancy in the curriculum through Secondary School Reform initiatives and through our own creative efforts. We invite our parents/guardians, alumni, and community members to actively partner with us in this endeavor and to disseminate our vision and mission of creating a culture of successful life-long learners. This collaboration will provide positive resources for our faculty’s professional development and students' academic and social growth. Remember, Miami Norland Senior High School’s legacy of a high academic achieving institution will continue to compete in a global society. Join us for what we know will be a break-out year of achievement and success.